You will receive all of the images shown on the preview and more! 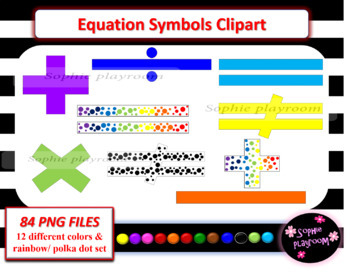 84 .PNG clipart includes six different equations signs (addition, subtraction, division, multiplication, equal and not equal) in 12 different colors and it also includes polka dot and rainbow colors. Print them out and use them in your classroom for teaching/planning, or around your classroom.